A Vancouver app developer creates an Artificial Intelligence Detective. A glamorous billionairess, Gina Lee, is kidnapped at the start of the Swiftsure Yacht Race. A ship is attacked in an act of high seas piracy in the Aleutians. How are these events connected? 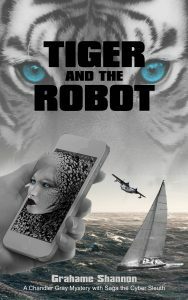 The book introduces Saga, the cyber detective, who travels in a smart phone, and lives in the Cloud. Her hapless creator, a sailor and software geek, accidentally becomes a private detective. The quest to rescue the kidnapped Gina Lee becomes an Odyssey spread across the rugged coasts of Alaska and BC. Humorous and dangerous by turns, the action moves relentlessly toward its bloody conclusion.